After his arrival in Jamestown in 1619, Governor George Yeardley immediately gave notice that the Virginia colony would establish a legislative assembly. This assembly, the House of Burgesses, first met on July 30, 1619. Although many differences separated Spain and France from England, perhaps the factor that contributed most to distinct paths of colonization was the form of their government. Spain and France had absolute monarchies, but Britain had a limited monarchy. In New France and New Spain, all authority flowed from the Crown to the settlers, with no input from below. An absolute monarchy is a state in which the monarch has sovereign power and controls all aspects of government without being checked by any representative assemblies. A limited or constitutional monarchy is a state in which the power of the monarch is checked by other constitutionally sanctioned institutions, such as a representative assembly (e.g., the British Parliament). The English kings who ruled the 13 original colonies reserved the right to decide the fate of their colonies as well, but not alone. The colonists drew upon their claims to traditional English rights and insisted on raising their own representative assemblies. Such was the case with the Virginia House of Burgesses, the first popularly elected legislature in the New World. But forasmuch as men's affaires doe litle prosper where God's service is neglected, all the Burgesses tooke their places in the Quire till a prayer was said by Mr. Bucke, the Minister, that it would please God to guide and sanctifie all our proceedings to his own glory and the good of this Plantation ... The Speaker ... delivered in briefe to the whole assembly the occasions of their meeting. Which done he read unto them the commission for establishing the Counsell of Estate and the general Assembly, wherein their duties were described to the life ... And forasmuch as our intente is to establish one equall and uniforme kinde of government over all Virginia &c.
The House of Burgesses, the first legislative assembly in the American colonies, held its first meeting in the choir at Jamestown Church in the summer of 1619. Its first order of business: setting a minimum price for the sale of tobacco. English landowners had insisted on meeting with their leaders for consultation in local matters ever since the Magna Carta was signed in 1215. Virginia settlers expected that same right. 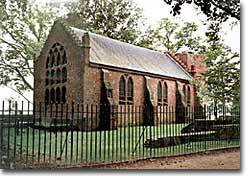 Modeled after the English Parliament, the House of Burgesses was established in 1619. Members would meet at least once a year with their royal governor to decide local laws and determine local taxation. In April, 1619, Governor George Yeardley arrived in Virginia from England and announced that the Virginia Company had voted to abolish martial law and create a legislative assembly. It became the House of Burgesses — the first legislative assembly in the American colonies. 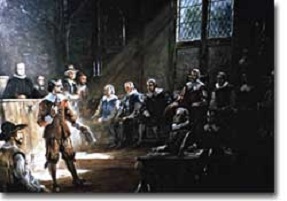 The first assembly met on July 30, 1619, in the church at Jamestown. Present were Governor Yeardley, Council, and 22 burgesses representing 11 plantations (or settlements) Burgesses were elected representatives. Only white men who owned a specific amount of property were eligible to vote for Burgesses. King James I, a believer in the divine right of monarchs, attempted to dissolve the assembly, but the Virginians would have none of it. They continued to meet on a yearly basis to decide local matters. What is the importance of a small legislative body formed so long ago? The tradition established by the House of Burgesses was extremely important to colonial development. Each new English colony demanded its own legislature in turn. Historians often ponder why the American Revolution was successful. The French, Russian, and Chinese Revolutions each ended with a rise to power of a leader more autocratic than the pre-revolutionary monarch. There have been hundreds of members of Virginia's House of Burgesses. Among the most famous are: Peyton Randolph, William Byrd, George Washington, Thomas Jefferson, Edmund Pendleton, and Patrick Henry. But starting with the Virginia House of Burgesses, Americans had 157 years to practice democracy. By the time of the Declaration of Independence, they were quite good at it. Who attempted the first voyage to the New World for England in 1583? What was Sir Walter Raleigh's short-lived English colony in the New World? What name was given to the first baby of English heritage born in the New World? What was the first joint-stock company to launch a venture to the New World? What was the first permanent English settlement in the New World? What was John Smith's motto? "Eat, drink, and be merry." "All work and no play makes men dull." Which of the following ventures did Virginia settlers NOT attempt? Who was the leader of the Algonquian peoples after Powhatan died in 1618? What was the first legislative assembly in the colonies? James I ruled England from 1603 to 1625 and fiercely believed in the divine right of kings, which was rejected by both Parliament and the Virginia Company colonists who formed the House of Burgesses. This Britannia website provides a brief biography of James I. When Winston Churchill stated, "[H]ere is a law which is above the King," he was speaking of the Magna Carta. Colonists strongly believed that their rights and freedom as Englishmen lay in the Magna Carta. This website from the National Archives and Records administration offers a detailed history of this document as well as a link to a translation of the 1297 version. The House of Burgesses met many, many times and as a result had many, many members. This page is simply a list (though it may be incomplete) of the members who served in the Virginia House of Burgesses. Are any of your ancestors on the list? The settlers of Jamestown, Virginia, recognized the unique situation and opportunity that lay before them in the early years of the 17th century. In 1619, 22 burgesses and Governor George Yeardley took part in the first legislative assembly of the American colonies. Their creation of the House of Burgesses later inspired the American Revolution and the subsequent creation of the United States. This website from the Colonial National Historical Park presents the people involved and the laws passed during this momentous event. Although Massachusetts and Pennsylvania often receive much of the credit for colonial and revolutionary politics and government, the United States owes a debt of gratitude to Virginia and the first legislative assembly, the House of Burgesses. This independent website examines the history of Virginia government and its role in American politics. Although the House of Burgesses first convened in 1619, the measures taken by the assembly were worthless until ratified by the Virginia Company, the stockholders of the colony. Virginia was granted a written constitution in 1621 that ratified the actions of the General Assembly (House of Burgesses). The constitution also included an important provision that prohibited the Virginia Company from passing any laws without the approval of the Assembly. The primary document "An Ordinance and Constitution of the Virginia Company in England, July 24, 1621" is presented at this Yale University website. How were burgesses elected? 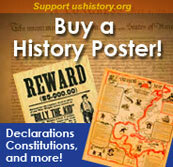 Who constituted a citizen in colonial Virginia? This Prince William County website answers these questions and delves into the history of Virginia politics. Special attention is given to the Prince William representatives to the House of Burgesses. John Pory, "A Reporte of the Manner of Proceeding in the General Assembly Convented at James City"
As Secretary of Governor George Yeardley's Council of Estate, John Pory was responsible for recording the minutes of the first meeting of the House of Burgesses. His records, including the proceedings of the first Virginia Assembly in 1619, are part of the Library of Congress's Thomas Jefferson Papers collection. This website provides many letters and documents from this era, including John Pory's "A Reporte of the Manner of Proceeding in the General Assembly Convented at James City," which provides a unique perspective on this historical event.